The Shepherd knows each lost sheep; He seeks those gone astray. God understands our heartache when a child wanders away. and He rejoices with us when they come to the cross. There is joy in the presence of the angels of God. A sinner has repented; let's make merry and be glad. For this, my son was dead, and is alive again. He was lost, and is found; I've received him safe and sound. Except the Father draw him, he'll not come to the Son. God hears the prayers of mothers weeping for a lost loved one. and He is never willing that any should perish. For this my son was dead,, and is alive again. He was lost and is found; I've received him safe and sound. 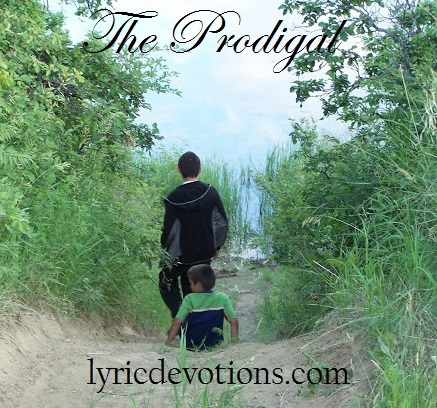 Based on Luke 15:11-32 The story of the prodigal son. Thank you for visiting Lyric Devotions. A free pdf of the sheet music is available for most songs. Requests can be made through the contact form on the sidebar. Clicking on affiliate links or purchasing through these links may earn me a small commission on the purchase, but will not affect the price you pay. Thank you for supporting Lyric Devotions!